The brain's major purpose is to generate actions to interact with our environment. Sensory inputs are the main sources of information used to guide these actions. In my lab, we are interested in (1) how different sensory inputs are combined to generate a unified representation of the world that can then be (2) interpreted and transformed into action plans which (3) control our different motor systems. All three stages of this process are highly dynamic and represent complex computational steps. Please find a list of equipment available in my lab here. How and where does the brain perform the complete 3D reference frame transformation of hand and target position for reaching? 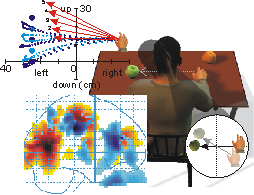 This research line investigates how the brain performs the geometric transformation between the incoming visual (and / or proprioceptive) information of the hand and/or reach target and the motor command sent to direct reaching arm movements. I'm interested in how position and velocity signals are used and combined in the brain in a geometrically optimal fashion to produce accurate behavior. 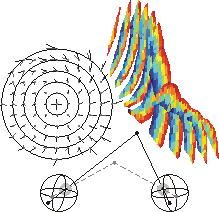 Investigating this issue involves modeling of the underlying geometry, a neural network approach to address how this transformation could be performed by distributed processing in the brain and functional brain imaging to uncover where and when in the brain these processes take place. Where and how does the brain use 3D position and velocity signals for saccade and smooth pursuit control? Smooth pursuit and saccadic eye movements interact a great deal. Saccades can occur during smooth pursuit and in addition the head can move during a pursuit movement as it can during saccades. As a result we have 3 control systems (saccade, pursuit and head) that have to be coordinated in time in order to produce accurate and optimal combined behaviour. The use of retinal and extraretinal 3D position and velocity signals in this control problem are of special interest to me. 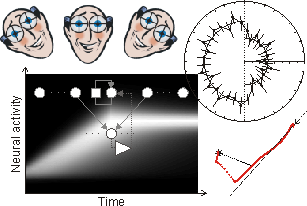 How can we generate geometrically accurate combined eye and head movements? How is visual information transformed into motor commands for the eyes and head. And how do higher-level processes (e.g. attention) influence this eye-head coordination for saccades and pursuit. How are different sensory sources used for perception and internal representation of 3D space? We live in a 3D environment. However, most research investigating perception and action in 3D space ignores the distance dimension and considers space merely as a 2D surface. Therefore, there are many unsolved problems and questions concerning the use of 3D signals in perception and the internal representation of 3D space for action. For example, how can a 3D internal representation of space be constructed from binocular vision in a distributed processing scheme? Are the same 3D eye and head position signals that are used for action also used for perception? There are many open theoretical and experimental questions to answer here.